Howdy fellas, my name is John Kelley and I hail from South Dakota. I have been working an and off in upstate NY since 2012, but have been focusing most of my free time concentrating on Lake Ontario, since I can always catch as many walleyes as I want when I am home. 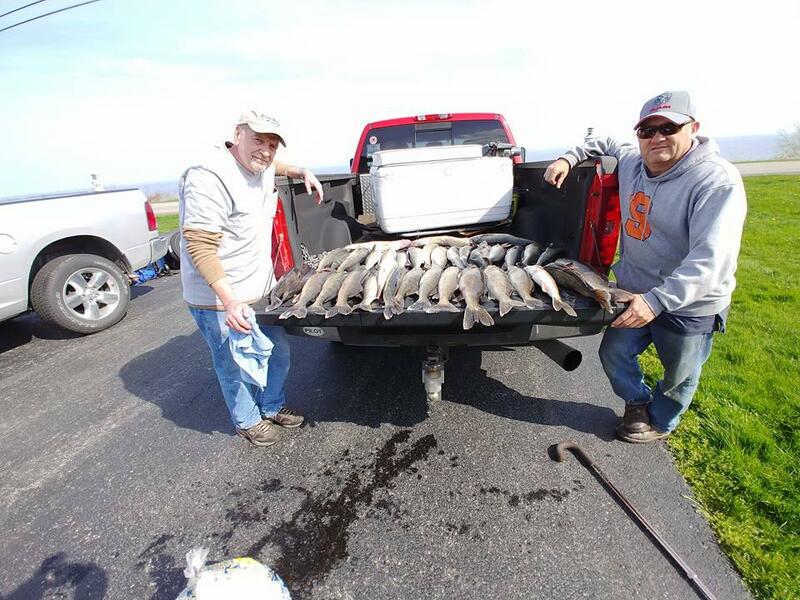 I decided to go fishing with my good friend Ed Ball and our good mutual friend Dennis Walter on Saturday, though, and check out the spring shallow water night bite on Lake Erie. We had a pretty good go of it, and returned to the truck at midnight to offload our Saturday limit of 18 nice male walleyes. 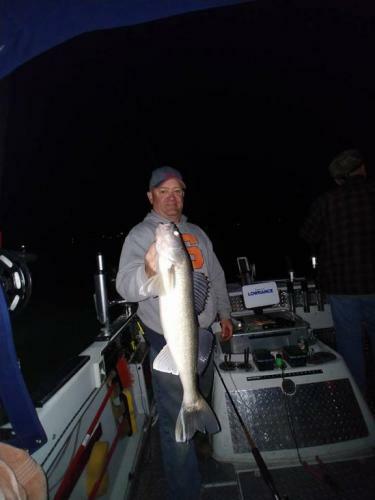 We then headed back out to our waypoint after 1:00 a.m., and caught our sunday limit of 18 nice, male walleyes by 5:00 a.m. We were fishing west of Dunkirk. Water was very colored with low visibility. All our fish were between 19-26" long, and no females in the group. All the fish were milting, or still had milt in them, so the spawn looks like it is right about in the middle. The big females ought to be hungry pretty soon, I am thinking. The lake was like glass all night, so it was awesome for boat control. 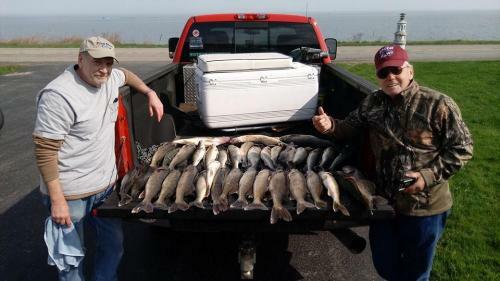 Not a bad first outing for me on Lake Erie, but all I had to do was set lines and reel and net fish all night. Captain Ed drove us right over all the hungry fish!! I am not at liberty to say what the magic lure, depth, or waypoint was, because it was not my boat, and I don't want to betray my friends. Great night of fishing, though. I also posted this in the Introduction section. Hope you enjoy the pics. Night Time is the Right Time in your case......Good stuff! Thanks for Posting! Even with your tight Lip HA HA! I don't know Gary, looks like a thousand words to me. 36 fish in possession? The ECO is going to look you up. 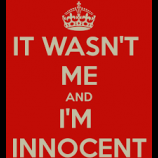 They did nothing wrong. Read the reg. highlighted in red. Perfectly legal. Ed Ball has been guiding for years and I'm sure he is well aware of the rules. Let's put tis discussion to bed! No more than two days’ legal take of nonsalable fish may be transported unless a permit is obtained from a DEC Regional Office, or the fish are frozen, processed and packaged for storage. Smelt, suckers, alewives, and blueback herring taken by dip nets (Tidal Hudson River Regulations) or angling, and suckers taken by spearing, may be transported overland by motorized vehicle for consumption purposes only. Once those species are transported away from the water body, they may not be transported back to any water body for use as bait. Salable fish may be transported in any number. Baitfish transportation regulations can be found on Baitfish Regulations. I think separate coolers would be safe transportation. Being combined together would open to question ?
" We had a pretty good go of it, and returned to the truck at midnight to offload our Saturday limit of 18 nice male walleyes"
I was stopped by an ECO officer who claimed I had two day limit is ducks. At the check in station, mine and my driver who was parking the car. My saving moment was they were tied together on separate strings. 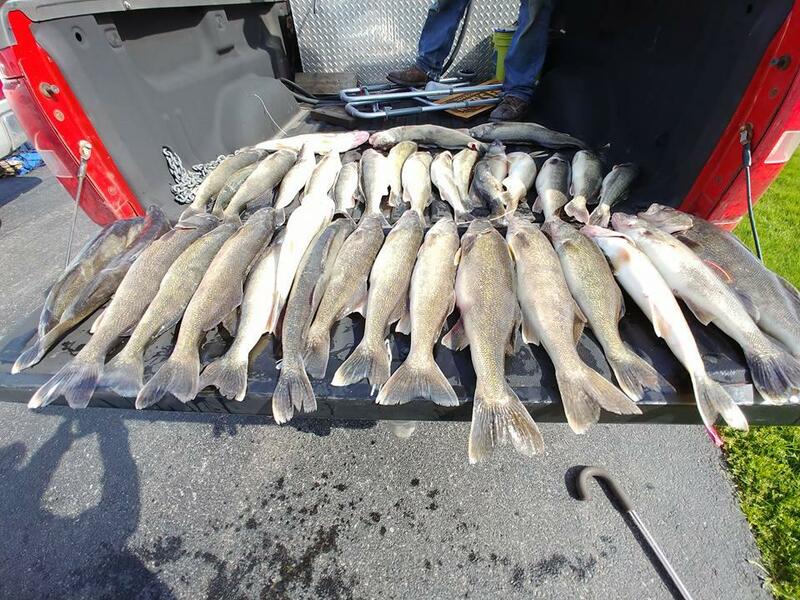 Basically there were six days catch there in the back of the truck that could be cited. Separate coolers and stringers or bags would help explain the catch. So you got your limit two days in a row but didn't clean them, the first day, ? Didn't read the other post where you dropped off a limit. I read the whole thing, he did state they dropped the fish off and went back out. I see nothing wrong with it.